Our train pulled away from Malaga on Sunday morning at 10:40 a.m. 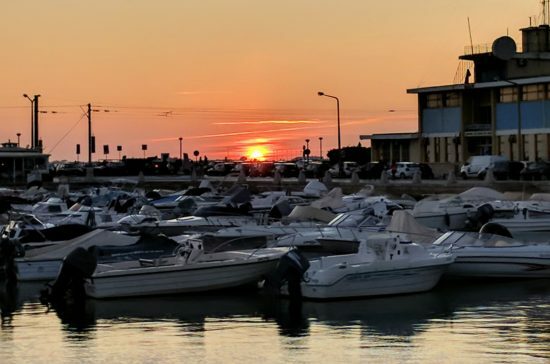 It had been ten days of rest and relaxation, eating our weight in tapas, drinking sangria and taking long leisurely walks along the waterfront and beach promenade. Five days in to our stay our friends from the US arrived in Malaga and doubled the fun. Add in a few cups of thick and creamy hot chocolate with hot out of the fryer churros dusted with cinnamon sugar, a fantastic Flamenco Show and we had ourselves one grand respite after eight epic weeks of traveling across Europe with Eurail. Plus, an additional 4 weeks of travel on our own. Whew! It was exactly what we needed. It was the perfect ending. And, it was the perfect beginning of the next adventure. Leaving Malaga at 10:40 a.m. we were back in Seville 2 1/2 hours later. A quick taxi ride across town to the bus station and we were on the bus and off to Faro, Portugal. Three blurry-eyed hours later we walked across way too many cobblestone streets and checked in to our hotel. I can’t tell you how much I loathe cobblestone when pulling a 45 lb. rollie suitcase. All too soon Monday morning dawned way too early as the alarm sounded at 5:45 a.m. Wanting to sleep as long as we could, we had just 30 minutes to be out in front of the hotel to catch a taxi. A taxi because one way across all of that cobblestone was enough. Spot on at 7:00 a.m. our train pulled away from the tiny Faro train station and we were on our way toward Porto via Lisbon. It was a 5 1/2 hour journey, half of which I spent standing between train cars trying to convince myself that I was not suffering from motion sickness. Normally, having to sit backward in a train coach doesn’t bother me, but this particular train rumbled and jostled and stopped and started more than usual leaving me green in the face. I had to wait until enough people exited the train so that I could snag a forward facing seat for the rest of the journey. I was so unbelievably grateful as the train finally arrived in Porto I didn’t even care that a cranky old women yelled at me in Portuguese because somehow she was convinced that I alone (not the other 10 people) was blocking the aisle. I swear, cranky old women are cranky all over the world and in every language. Travel Tip: By the way, in case you’re wondering why we took such a convoluted route between Malaga, Spain and Porto, Portugal, the answer is simple. It was the least convoluted option, at least for us. There are in fact trains that travel between the cities, but they travel through Madrid or Barcelona which just makes the trip all that much longer. For some reason, it’s just a difficult passage. Porto, one of our favorite cities. There is just something special about Porto. Ask anyone who has spent time here and they’ll tell you the same. Maybe it’s the beautiful Douro River, maybe it’s the red tiled roofs or the beautifully tiled building facades, or maybe it’s the people. 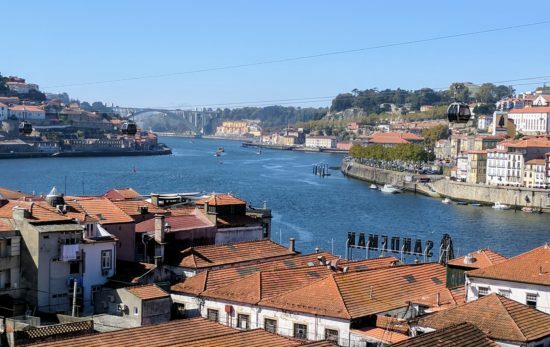 Quite possibly it could be the fact that Porto is the home of port wine. Or, maybe it’s the university students who seemingly attend Hogwarts. These students were posing for a woman when I asked if I could take their photo as well. Seriously, how adorable are they? 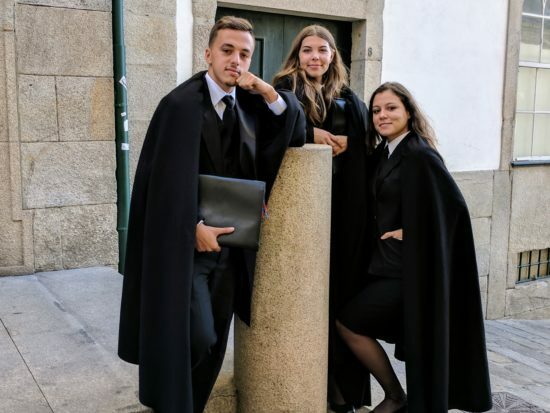 I think the future of Portugal is in good hands. And, yes, J.K. Rowling was inspired by these uniforms. She spent time in Porto while writing Harry Potter. Whatever the reason it feels good to be back and after the summer heat from hell, we’re loving the cool weather here in Porto. The temps are in the mid 70’s and the trees have already started to turn and fall weather is in the air. I became downright giddy when I had to pull out my heavy sweater. It was like greeting an old friend. Fall is my absolute favorite time of the year and while I’m a bit sad to be missing the spectacular fall foliage at home, on the east coast of the US, I’m looking forward to experiencing what Porto has to offer. The beautiful Douro River flows through Porto. The game plan (at least for now) is to find a place to stay, unpack and stay awhile. I am half Portuguese and I think it’s about time I get to know the culture of my mother and grandmother and all the mothers before them. When we were here in 2015, we fell head over heels and told ourselves we would make it back. We’re just going to live among the locals and see where it leads us. And, while we’re busy doing as little as possible, we’ll see if we can continue to work our way through the residency process as part of our expat experiment. Whether it comes together or not isn’t all that important in the big picture. What’s important is just being here… until we’re not. Thank you, Suzanne! And, thank you for your support and encouragement. Stay tuned, as we have many stories to share. It has been quite an eventfull summer for you, I have enjoyed travelling vicariously . For now enjoy Porto and discovering your Portuguese roots. Endings and beginnings! You have arrived and hopefully, the next road you’re on will be fairly smooth with only a few cobblestones to disrupt the journey while you drag your suitcases behind you. There aren’t too many things standing between you and your one-year residency visa so I’m (selfishly) hoping that you’ll decide on that course so I can visit you. And how right you are about there being no easy way to travel between Spain and Portugal. We’re doing the bus-train combination ourselves next week to head out for some time in Valencia and I’m hoping I can get a forward seat on the train too! 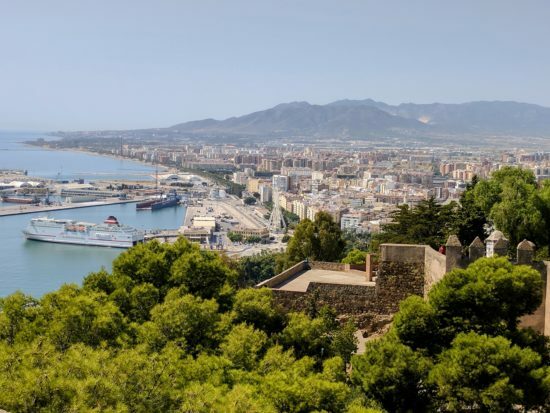 Our AirBnB host in Malaga told us that Spain and Portugal have no problems with each other, but there is no interest in making it easier to travel between the two countries. He just shook his head and laughed. It’s not that funny though, cuz it’s a real pain in the arse! 🙂 Have fun in Valencia, we’ve heard it’s lovely. Porto, one of my favorites too. You must visit the book shop sometime. Llelo–I think that is how it is spelled. Just like Elizabeth used to say yellow. Save a little port for the rest of us. It’s called Lello & Irmao and we visited the store (and bought a book) when we were in Porto in 2015. It has become so wildly popular with the tourists (who line up down the block) that you have to pay 4 euros to enter the store, but if you purchase something the 4 euros goes toward the purchase. It’s smart on the part of the store, but I feel sorry for the locals who can’t get in the door. I suspect though that in a few more weeks when the weather turns the tourists will fade. I’ve loved following your adventures, Patti! It’s a lifestyle I hope to have myself someday, and also not sure if I’ll seek residency or be satisfied with the Schengen shuffle–ha! I watched your YouTube videos too. Your Porto studio looks lovely. Are you paying Airbnb type prices? Rental rates are certainly a benefit of getting residency, I imagine. Can’t wait to read about your fall and winter in Portugal! Hey Patty, thanks so much for posting a comment and for following along on our journey. We are grateful for the support. Currently, we are paying monthly rental fees for our studio, not AirBnB rates. Porto is a fantastic city and wildly popular, so as we’ve learned finding short term accommodations is a bit tricky. We are very much looking forward to experiencing what Porto has to offer for the fall season. I’m loving your adventure. OK so not the cobblestones and suitcases. Yet how delightful to be in one place that you already admire for, who knows at a month at a time. So look forward to more. Thanks, Gaelyn. Cobblestone streets ooze with charm, but they are a pain in the arse to walk on, I learned that the hard way while walking the Camino de Santiago in 2015. We have unpacked for who knows how long, but we are very much enjoying Porto.